More and more people are opening up their fireplaces to enjoy the warmth and comfort of an open fire. The 'living flame' becomes the focus of the room and the family. An open fire creates a sense of well-being by calming and relaxing. There are hundreds of different styles to choose from and they all offer the 'living flame' and cosy glow that only a real fire can provide. The open fire provides heat for your home by direct radiation, although some fires are available with a convection chamber to circulate warm air around the room. The modern open fire, properly fitted and sealed is cleaner, brighter and more fuel efficient than ever before. Open fires with a compatible back boiler considerably increase the efficiency of your home heating system, provide hot water and heat for up to seven radiators. Controllable open fires are capable of slow burning through the night for up to eight hours on one fuelling and easy slide-out ash pans allow the removal of ash without having to let the fire go out. Free standing canopy open fires are also available for installation into large inglenook fireplace openings. For more information on solid fuel open fires and stockists, visit the websites of leading manufacturers on our Links page or telephone our local call rate Helpline 01773 835400. 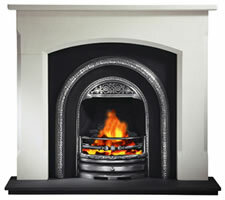 More and more people are opening up their fireplaces to enjoy the warmth and comfort of an open coal fire. The 'living flame' becomes the focus of the room and the family. An open fire always creates a cosy sense of well-being. There are hundreds of different styles to choose from and they all offer the 'living flame' and reassuring glow that only a real fire can provide. Controllable open fires are capable of slow burning through the night for up to eight hours on one fueling (mineral fuel) and easy slide-out ash pans allow the removal of ash without having to let the fire go out.